The Islamic Republic of Iran's engineering of its so-called elections starts from the very day the Guardian Council announces the short list of candidates. For the presidential candidates, the Guardian Council does not actually disqualify any of the candidates, but the twelve unelected members appointed by the Supreme Leader, concoct a short list that includes not only the candidate they deem most suitable to be the president for the next four years, but also the rival candidates. In order to ensure a large turnout, at least one bogey figure and a few other minions appear in the final short list. The purpose of this arrangement by the Guardian Council is to package something that would resemble a genuine election with real opposing factions and bustling excitement amongst the people. What matters most is getting a high turnout. Iran’s elections start with a general feeling of apathy among voters, but the establishment is highly skilled in turning the initial apathy into passionate enthusiasm. Crucial to this is the selection of the bogey figure, which in the last presidential election manifested itself in Rouhani’s main rival, Ebrahim Raisi. Raisi was not a willing candidate. As the custodian of the Imam Reza Shrine foundation, he has the best job in Iran: overseeing an endowment/conglomerate with an estimated revenue of $201 Billion exempt from tax and government inspection. Raisi is also the son-in-law of Mashhad’s Friday prayer leader, Alam-ol-Hoda, a cleric coming right out from the dark ages, despite his Father Christmas cuddly looks. Alam-ol-Hoda’s vehement opposition to concerts being held in Mashhad and his zeal in implementing the compulsory veil with an iron fist makes him one of the most reactionary clerics even by Islamic Republic standards. Further efforts were made to make sure the bogey figure will scare the living daylights out of the apathetic voters and convince them to turn up at the ballot box. Audio tapes of Ayatollah Montazeri, the first would be successor to Ayatollah Khomeini, were released after three decades by his son Ahmad, which named Raisi as instrumental in the “death committees” that carried out the 1988 massacre of political prisoners. Ahmad Montazeri at first faced a 21 year prison sentence for releasing the audios, but it all mysteriously vanished and he was neither imprisoned nor even disrobed. The bogey figure was now ready, nicknamed Ayatollah Murderer, he just needed to be convinced to run as a candidate, and so some behind the scenes persuasion was necessary. The incumbent president at the time of the elections, Hasan Rouhani, was to play the anti-establishment good cop. While Rouhani confidently pushed the establishment’s red line boundaries, the Supreme Leader gave implicit hints that he preferred the bogey man candidate. The truth is that if the Supreme Leader really opposed Rouhani, he could have had him disqualified for the alleged plagiarism in his PhD thesis from Glasgow Caledonian university or for his false claims about having a PHD in 1980 when he ran for the Majlis as ‘Dr. Rouhani’. 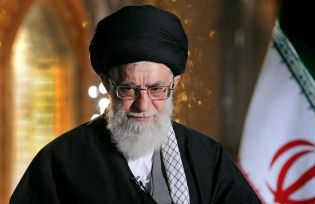 Furthermore, the Supreme Leader could have picked far better rival candidates than the other non-entities or the likes of the Tehran Mayor, who had endured a backlash of popular discontent for his handling of the Plasco shopping mall fire tragedy and the revelations of massive land bribes by his office. A better candidate to really threaten Rouhani’s re-election, for example, would have been Parviz Fattah, the former energy minister and the current head of the Imam Khomeini Relief Committee which caters for 4 million beneficiaries. Instead, Parviz Fattah was persuaded not to register himself as a candidate and save himself for another day. Faced with a choice of an incumbent president who played the role of an anti-establishment outsider against the “Ayatollah Murderer”, apparently favored by the Supreme Leader, the apathetic voter was faced with a stark choice of preserving the current status quo or facing even worse conditions. As usual a party atmosphere prevailed to ramp up the enthusiasm. Of course this is normal in a conventional democracy, but we are talking about the Islamic Republic here, where such displays of joviality is not usually permitted. Mixed gender street parties with live bands and DJs took place even around the corner from where Alam-al-Hoda, the Mashad Friday Prayer leader who had banned concerts, lived. Boys and girls mingled freely, sang and danced until the late hours with no sign of the morality police. Iran’s embassies which usually require women to wear the mandatory head scarf to enter their premises turned a blind eye to female voters who flaunted the Islamic dress code. Friday Prayer leaders boasted in their sermons that to vote was a national duty and people from all walks of life, regardless of their political or religious persuasions could vote! Thank you very much for all that freedom! Its not surprising that Iran’s elections are the only state controlled process where even Iran’s persecuted religious minority, the Baha’is, can also cast their votes, but of course not stand as candidates. The faction that hijacked the term ‘reformists’ in Iran, don’t actually do any campaigns or organise any civil disobedience or peaceful protests. Iran’s ‘reformists’ are solely tasked to resurface during the elections and persuade people to vote. In this task they are helped by countless ‘experts’ who appear on Persian speaking media and justify why this time it will be a catastrophe for people to boycott the elections. And so it is that the Iranian elections continue to be engineered with great skill and precision.